We beauty addicts love our incentives to buy don’t we? We basically know full well that we don’t need half the stuff that ends up in our hot little hands (except mascara, which should be made available on the NHS) and so sometimes, it’s the little incentives that push us over the edge more than anything. 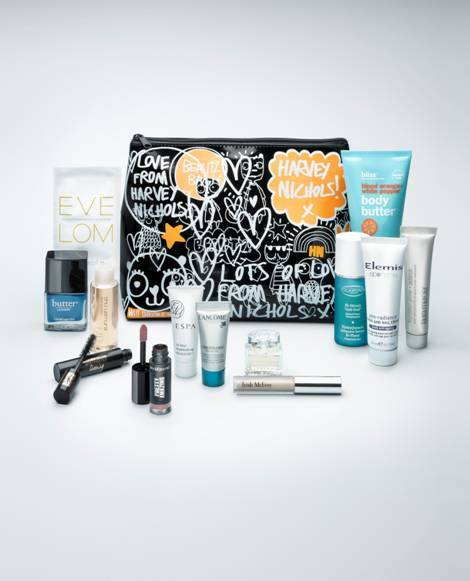 Judging by the offer that just landed in my inbox, Harvey Nichols clearly knows this as launching from the 12th March will be a beauty gift with purchase worth over £110. Yes. Really. That’s gotta be worth going over the edge for. Eve Lom Cleanser, Shu Uemura’s 3 in 1 Cleansing Oil, Lancome’s Visionnaire or Clarins HydraQuench serum, ESPA 24-hour Replenishing Moisturiser, Bliss’ Blood Orange and White Pepper Body Butter, Laura Mercier Radiance Foundation Primer, Trish McEvoy Eye Base Essentials in Bare, YSL Shocking Mascara, bareMinerals Pretty Amazing Lipgloss, one of five Butter London nail colours, Elemis Pro-Radiance Hand and Nail cream and L’Eau de Chloė perfume. All of which come beautifully presented in a limited edition Harvey Nichols cosmetics bag designed and illustrated by artist Will Broom. If £110 is a little over your spending budget this month, perhaps you have a friend you could combine the Mother’s Day gift purchase with? Sneaky… moi? That is a great GWP – I want it purely for the Butter London polish!